LA CROSSE, Wis. (WKBT) – The La Crosse Area Chamber of Commerce is celebrating 150 years of serving the community. The chamber marked the occasion during their annual meeting Monday night at the La Crosse Center. 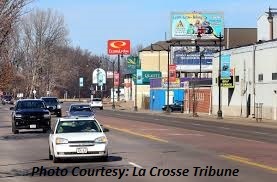 Chamber officials say they couldn’t have done all their work in improving the La Crosse area over the past 150 years without the help of its member businesses, more than 25 of which have been around for more than a century. “Our backbone is really the businesses that have been there with us through it all, thick and thin. So I think the longevity of our Chamber is greatly due to their efforts and what they have done over time for the community as well,” said Executive Director Vicki Markussen. Several local organizations and business leaders were recognized by the Chamber for their contributions to the community. That includes the Franciscan Sisters of Perpetual Adoration who received the Chairman of the Board’s Community Service Award.